(Phys.org)—A team of researchers working in Singapore has come up with what they believe is a way to apply a topologic insulator to an object to prevent sound waves from being bounced back and detected by a source. They have published their work in the journal Physical Review Letters. 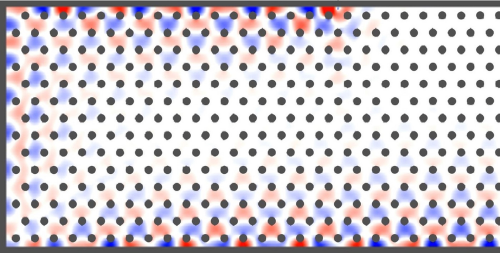 Scientists have developed ways to coat materials with other materials to causes electric current to remain on the surface, preventing damage to sensitive parts inside—such coatings are called topological insulators and are generally based on causing less scattering and creating a band gap. In this new effort, the research team has expanded on that idea to bring a similar result for insulating objects from sound waves. To make a topological insulator work against sonar would involve creating a coating or cover that could cause sound waves to propagate around an object (instead of scattering) rather than allowing them to be bounced back to a receiver. To make that happen, the researchers envision a cover made up of a lattice of spinning metal cylinders, each of which would be surrounded by a bit of fluid which would itself be contained within an acoustically transparent shell. The same fluid would be used to fill the spaces between the cylinders, but it would not move. Because of the spinning movement inside, a vortex would be created in the fluid that surrounds the cylinders. In this setup, sound waves would not be able to move through the center of the structure due to a periodic pattern that would produce a sonic band gap—but the rotating fluid around the center would allow for causing propagation to occur in a predefined direction—the edge states, the team notes, could guide sound waves with high precision. A submarine covered with such an insulator would be invisible to sonar because sound waves sent in its direction would be routed in a direction away from where they came from, preventing them from bouncing back to the source. The work thus far by the team is purely theoretical, but they suggest there is no reason to believe it would not work in practice. The most difficult part they note, would be dealing with irregular "bumps" on a surface, which could throw off the propagation if not handled properly. The manipulation of acoustic wave propagation in fluids has numerous applications, including some in everyday life. Acoustic technologies frequently develop in tandem with optics, using shared concepts such as waveguiding and metamedia. It is thus noteworthy that an entirely novel class of electromagnetic waves, known as "topological edge states," has recently been demonstrated. These are inspired by the electronic edge states occurring in topological insulators, and possess a striking and technologically promising property: the ability to travel in a single direction along a surface without backscattering, regardless of the existence of defects or disorder. Here, we develop an analogous theory of topological fluid acoustics, and propose a scheme for realizing topological edge states in an acoustic structure containing circulating fluids. The phenomenon of disorder-free one-way sound propagation, which does not occur in ordinary acoustic devices, may have novel applications for acoustic isolators, modulators, and transducers. They mention its potential use to block sonar,which is obviously a military application. But can this be adapted to have a significant non-military potential use to block sound pollution? This sounds like a very complicated (skin) for a submarine to have. " spinning cylinders"? As far as a remedy for noise pollution, same critique applies, seems complicated. Apparently soap bubbles have amazing sound absorbing properties though.